In this Sept. 4, 2013 file photo Mustangs recently captured on federal rangeland roam a corral at the U.S. Bureau of Land Management's holding facility north of Reno, in Palomino, Nev. The U.S. Forest Service has built a corral in California that could allow it to bypass federal restrictions and lead to the slaughter of wild horses. 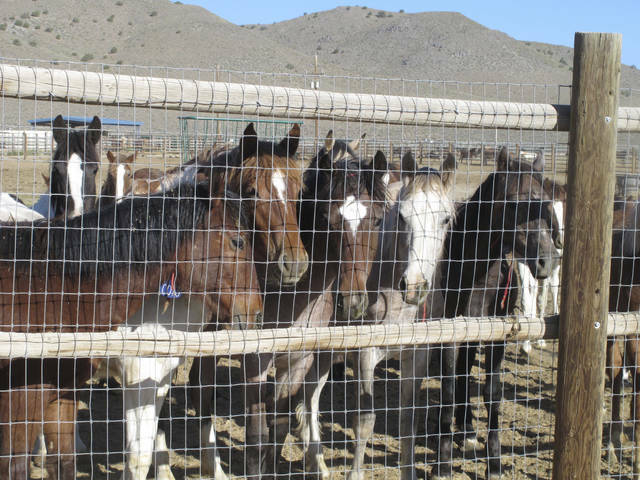 The agency acknowledged in court filings in a potentially precedent-setting legal battle that it built the new pen for mustangs gathered in the fall on national forest land along the California-Nevada line because horses held at other federal facilities cannot be sold for slaughter. (AP Photo/Scott Sonner). The agency denies claims by horse advocates it has made up its mind to sell the more than 250 horses for slaughter. But it also says it may have no choice because of the high cost of housing the animals and continued ecological impacts it claims overpopulated herds are having on federal range land. Disclosure statement: Christopher Witko has received funding from the Russell Sage Foundation. Partners: Pennsylvania State University provides funding as a founding partner of The Conversation US. LONDON (AP) — British Prime Minister Theresa May defied calls to resign as she faced a no-confidence vote Wednesday, a day after Parliament rejected her Brexit deal by a historic margin and unleashed a power struggle over control of Britain’s planned withdrawal from the European Union. But investors appeared to shrug off the rejection of May’s deal. The pound was up 0.1 percent at $1.2869 in early morning trading Wednesday in London, and the FTSE 100 index of leading British shares was down 0.1 percent at 6,888. Disclosure statement: Simon Usherwood receives funding from the Economic and Social Research Council, as Deputy Director of the “UK in a Changing Europe” programme. He sits on the academic advisory board of Modern Europe. The views expressed in this article do not reflect those of the research councils. Partners: University of Surrey provides funding as a founding partner of The Conversation UK. Another day, another record. The 230 majority against the motion to approve Theresa May’s withdrawal agreement on the UK’s exit from the EU smashes pretty much any parliamentary record one cares to discover. That May’s immediate response was to make time for the house to debate and vote on Labour’s motion of no-confidence in her the day after her loss was thus hardly a surprise: how else to respond to such a heavy blow against the central platform and policy of the government? And yet the abiding impression of these events was of avoiding a resolution, for as long as possible. Most obviously, May did not offer her resignation. That was a reflection not of her principles but rather her analysis of the situation. As she noted in her statement, a lack of majority for her deal doesn’t mean there’s a majority for another course of action. Without that alternative majority, she clearly feels there is still everything to play for and she is the right person for the job. In essence, what May offered parliament was a “put-up or shut-up” proposition. Should the government win the confidence motion – which looks very likely indeed – she will hold a series of cross-party talks, inviting parliament to bring ideas and suggestions about how to build a majority position. The results will then be put to the EU for negotiation and agreement. At one level, that might sound like a generous offering to a parliament that Number 10 has tried hard to keep well away from the process to date. It looks like a concession to those who have said May’s offer is unacceptable. But in practice, this is just another stage in the longer-term Number 10 strategy of whittling away the options available, until only the withdrawal agreement remains. If you consider that there is no majority in parliament for any option at present – May’s deal, a softer form of Brexit, second referendum, or a revocation of the entire process – then this offer of talks looks more like a trap than an opportunity or a conciliatory gesture. The only two changes that might win over the kinds of numbers of MPs to secure a majority both look problematic. For Tory backbenchers or the DUP, the big bone of contention is the backstop arrangement on Northern Ireland. A limit on its application or the power for the UK to decide alone not to use it would have a very big impact on the support the government could get. Yet this is clearly not going to gain the support of the EU, which sunk very deep red lines around that part of the agreement. It cannot move those lines without compromising the interests of one of its own member states. Much more acceptable to the EU would be the other possible change: a commitment to a much softer Brexit, staying in the single market and the customs union, which would bring a lot of opposition parties on-side. In this case, the problem would be domestic: does May want to be propped up by the opposition; does the opposition want to prop up the government; and can May give up the one thing that has been central to her Brexit plans – an end to free movement? In short, the offer to parliament is intended to demonstrate that despite all its faults and Tuesday night’s hammering, the withdrawal agreement is still on the table, agreed by the EU and there to potentially be put to another vote following further discussions and guarantees. Thus we might find ourselves repeating this vote, with no substantive changes to the text and ever greater uncertainty about what will happen on March 29. May’s withdrawal agreement might still have a future, but this vote means that it is unlikely ever to become a popular and positive choice for parliament, or for the public in general. Being the least-bad option could get it over one hurdle, but it points to the bigger questions that the UK still has to face – what does its future relationship with the EU actually look like? 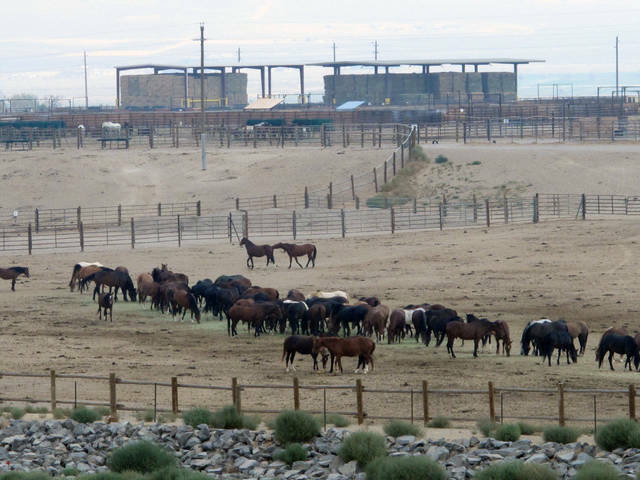 In this Sept. 4, 2013 file photo Mustangs recently captured on federal rangeland roam a corral at the U.S. Bureau of Land Management’s holding facility north of Reno, in Palomino, Nev. The U.S. Forest Service has built a corral in California that could allow it to bypass federal restrictions and lead to the slaughter of wild horses. The agency acknowledged in court filings in a potentially precedent-setting legal battle that it built the new pen for mustangs gathered in the fall on national forest land along the California-Nevada line because horses held at other federal facilities cannot be sold for slaughter. (AP Photo/Scott Sonner). https://www.sunburynews.com/wp-content/uploads/sites/48/2019/01/web1_122142604-978f5df89f1a4af9a34e3747f93bd477.jpgIn this Sept. 4, 2013 file photo Mustangs recently captured on federal rangeland roam a corral at the U.S. Bureau of Land Management’s holding facility north of Reno, in Palomino, Nev. The U.S. Forest Service has built a corral in California that could allow it to bypass federal restrictions and lead to the slaughter of wild horses. The agency acknowledged in court filings in a potentially precedent-setting legal battle that it built the new pen for mustangs gathered in the fall on national forest land along the California-Nevada line because horses held at other federal facilities cannot be sold for slaughter. (AP Photo/Scott Sonner).